Mosman Art Gallery (MAG) is a regional art museum located on the north shore of the harbour in Sydney, Australia. MAG is a broad based cultural institution and maintains a commitment to re-interpret Australian heritage through the commissioning of significant contemporary art projects. To mark the 200th anniversary of one of its most important local stories, the first land grant by colonial authorities to an Aboriginal person in Australia, MAG commissioned a ground breaking project called Bungaree's Farm. Bungaree's Farm was conceived as a cross art form program for the development of contemporary Aboriginal art practices consisting of research, residencies, workshops and exhibitions. The program worked on evolving new models for the development and presentation of contemporary Aboriginal arts. 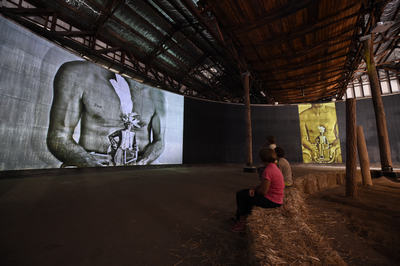 In commissioning Bungaree's Farm,MAG aimed to address core issues of Aboriginal Australian identity and unresolved and disputed historical issues in a contemporary art context. It was designed to appeal to general audiences, having particular relevance to students and audiences interested in Aboriginal and contemporary arts. • the granting of land at Mosman by Macquarie to Bungaree. 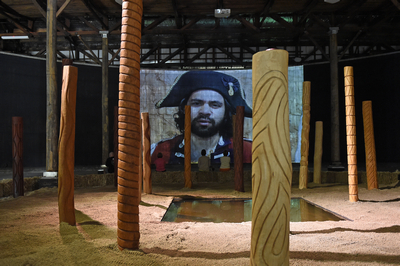 Bungaree's Farm developed into an exhibition of contemporary Aboriginal audio, video, performance and installation art exploring Bungaree’s legacy and commemorating the establishment of 'Bungaree’s Farm' by Governor Macquarie at Mosman on 31 January 1815. The exhibition was the result of a series of intensive residency workshops held on-site and led by renowned Aboriginal curator DjonMundine OAM. The works were showcased in the T5 Camouflage Fuel Tank (a large scale former WWII naval fuel tank at Georges Heights) on the site of Bungaree’s Farm. Bungaree's Farmrepresented the first program to appropriately acknowledge the importance of Bungaree and examine his life and story from an indigenous and contemporary visual arts perspective. This exhibition has provided the opportunity for this unique figure in Australian history to be critically reinterpreted by Aboriginal artists and brought to public awareness. It was essential that the project have indigenous control, ensuring that appropriate sensibilities and expectations were met throughout its development and presentation. The artists were selected for their professionalism, their creative approach, their prominence and ability to engage with the subject and historical materials to produce an exhibition of outstanding works which interpret Bungaree’s story through a broad range of artistic responses. Participating artists included Daniel Boyd, (BLAK) Douglas, Karla Dickens, Leah Flanagan, Amala Groom, Andrea James, Warwick Keen, Peter McKenzie ,DjonMundine, Caroline Oakley, Bjorn Stewart, Leanne Tobin, Jason Wing, Chantal Woods and Sandy Woods. The project was successful in achieving a critically, culturally and socially acclaimed monumental scaled series of artworks within the constraints of a strict timeframe, modest budget and difficult political environment. Led by Indigenous curator DjonMundine, this project commissioned fourteen emerging and established contemporary Aboriginal artists in the interpretation of key issues faced by Aboriginal society in the face of the forces of colonial settlement and the resultant state of European hegemony. After the failures of Aboriginal society to deal with the arrival of Europeans by Bennelong (through diplomatic means) and Pemulwuy (through active warfare), the story of Bungaree represents a third approach in coming to terms with the monumental shifts in power, control and identity faced by Aboriginal people then (and now). While Bungaree had previously been the subject of written publications, his story had not been critically examined in the context of contemporary Australian visual arts or from an Indigenous perspective. The Bungaree project redressed these critical oversights by providing the opportunity for his life and story to acknowledged, critically re-interpreted by Aboriginal artists and brought to public awareness. Bungaree's Farm examined the contemporary indigenous perspective on the impact of early colonial society, the qualities and personality of the historical figure of Bungaree and the continuing contemporary dilemma of living between conflicting world views. In his curatorial statement DjonMundine wrote: "The workshops were about the process of bringing into being an extension of the artist's practice in creating non-tangible expressions of Bungaree's personality and social being (moving image, projection, writing, ridicule and wit, in song and music and performance, both individually and/or in group display). I wanted to shift the Aboriginal presence out of the ghetto (of Redfern) to remind everyone, including ourselves, that Aboriginal people lived all over what is now called the Sydney basin - Aboriginal people are everywhere and Aboriginal people do everything". In order to resource the project, Mosman Art Gallery partnered with a number of organisations including Mosman Council, Arts New South Wales, Mosman Reconciliation, Sydney Harbour Federation Trust, National Parks and Wildlife Service and the Royal Australian Navy. Bungaree's Farm was successful in breaking new artistic ground, re-establishing Aboriginal arts practices and identity (in unlikely geographical areas), in establishing new venues for the presentation of artwork and in resurrecting the story of a prominent Aboriginal leader from the past. A central mantra of the project was that 'Aboriginal people were everywhere and Aboriginal people did all things'. Working on the site of 'Bungaree's Farm', the first land grant to Aboriginal people by colonial authorities, the project conceptually reclaimed this area for Aboriginal people. Based on the shores of Sydney Harbour on one of the most spectacular sites in Australia, the project showed that Aboriginal people were not and should not be confined to the urban fringes but that their strong cultural connections with places like Mosman needed physical confirmation and affirmation. That Aboriginal people do all things was reflected in the artwork produced, not limiting itself to traditional forms but attending to the highest and most cutting edge practices associated with contemporary art production. The project formed new ways of creating contemporary visual art work. Drawing from theatrical processes and from traditional Aboriginal cultural practices, the artists formed a group or ensemble for the development of visual art works. Modelled around an intensive series of workshops and residencies on the site of the original 'Bungaree's Farm', the project challenged artists and audiences to work and experience visual arts in combinations of form rarely experienced and beyond the normal practices of those involved. The focus of the project on the story and historical figure of Bungaree provided the artists with a central anchoring point which allowed them to experiment with both form and content. The development model used for Bungaree has now been taken up by other organisations and has provided a benchmark for the development of large scale Aboriginal art projects in Australia.